Bob and Sheila, owner-operators of Paradise Connections, are experienced sailors whose goal is to assist you in finding the best boat for your sailing vacation. Bob grew up around boats in Southern California, while Sheila's only boating experience was riding a ferry a couple of times. We met, got married and went to France in 1980. 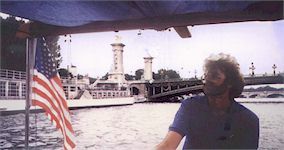 We lived on a péniche (French barge) for a few years on the Seine river outside of Paris at Le Port-Marly. This is where we got the boat-building bug. After building a few dinghies and a kayak, we decided to tackle a large project — a 26-foot liveaboard sailboat. Within six months we were living aboard Loose Moose on the Marne river east of Paris at Joinville-le-Pont. We had a lot of fun on Loose Moose. We had a nine-week trip where we travelled the Seine down to Le Havre and sampled the Normandy cuisine and visited the D-Day beaches before heading out into the English Channel working our way north, visiting numerous French ports. When we reached St. Valéry-sur-Somme we took down our mast and returned to the picturesque canal system of France. We meandered our way east and south until we met up again with the river Seine at Conflans and headed home to Joinville. We were one day late, and the last lock of our journey was closed for maintenance. We were surprised that they actually closed the lock on schedule as we were hoping to slip through. Our marina was just on the other side, but the lock was dry and there was an amazing amount of tires on the lock floor. So, it was back to Paris where we stayed at the marina at Bastille which was fun. This memorable journey was just a precursor of things to come... After much discussion and planning, we hired Phil Bolger to draw us a set of plans for Loose Moose 2. We found a riverside boatyard 50 km outside of Paris in Meaux (as in mustard & brie cheese). 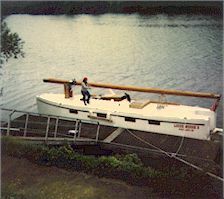 We tied Loose Moose up to the riverbank and proceeded to build Loose Moose 2, a 38-foot gaffed rigged "advanced sharpie". About a year later she was launched. We stayed in a marina on the west side of Paris for a year before deciding it was time to begin our new journey. We navigated the French canal system to the Mediterranean. We took the Seine east and met up with the Marne stopping a few nights at the boatyard in Meaux and treating a fellow boatbuilder to EuroDisney on Bastille Day. We continued east on the Marne and various canals and headed south on the Saone where we spent some time at St. Jean de Losnes. Then it was south to Lyons and the river Rhone. We took a side canal and stopped for a time along a bank just above Aigues-Mortes. We thoroughly enjoyed this isolated spot... taking advantage of the solitude to try to break the "commuter-mode" habits of Paris... learned to relax. We rode our bikes two miles to collect water from a spring and accomplished many "boat projects". We left France in September of 1994. We investigated the Balearic Islands and stopped in several Spanish ports before reaching the next important spot on our intinerary, Gibraltar. From Gibraltar we sailed to the Canary Islands. We made landfall on Lanzarote on Thanksgiving Day... not a turkey to be found anywhere. We intended to depart the Canaries in the Spring of 1995... in fact we did. We turned around and headed back to Gran Canaria before the first day was up as Bob's broken ribs were not healed sufficiently to make the journey... which was a good thing. 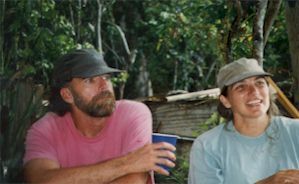 The summer of 1995 was notorious for hurricanes that ravaged the Caribbean and we were glad to still be on the other side of the pond in Arguiniguin. We enjoyed our second season of transatlantic preparations in Las Palmas. The comraderie between sailors was a wonderful experience. We had a successful, though tiring, Atlantic crossing (Bob, Sheila, and two cats). Once when we were becalmed we had a turtle pass us! We made our Caribbean landfall on the French island of Martinique. It was nice returning to France. We spent a few months there and really had a terrific time. We had plans of going to Puerto Rico but some Americans we met suggested St. Thomas. And to make a very, very long story a bit shorter.... here we are. 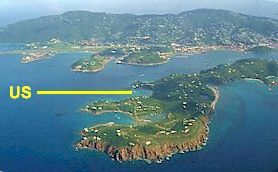 UPDATE: We are no longer in Honeymoon Bay on Water Island, USVI as in the photo. 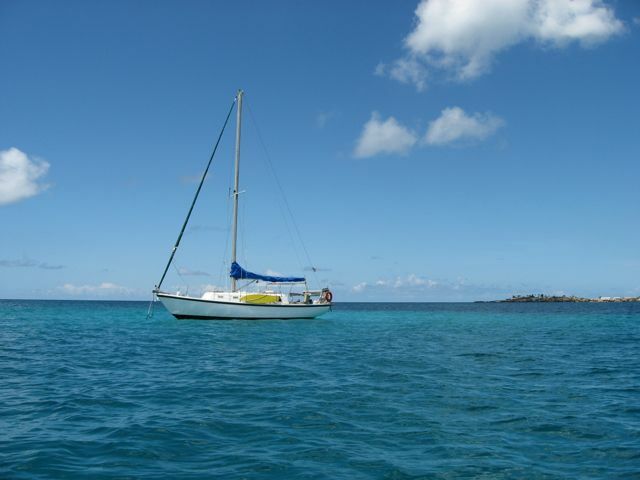 We sailed south from there in 2003 to the Dutch/French island of Sint Maarten / St. Martin. 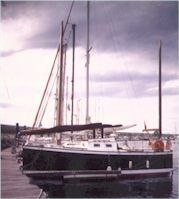 Paradise Connections is now based on our personal CAL-34 sailboat and we are currently sailing about the Caribbean. Due to the wonders of modern technology, we can stay in touch with our clients via cell phone, satellite phone, wifi, email and voip. So much nicer than a cubicle... I now have tan toes ! 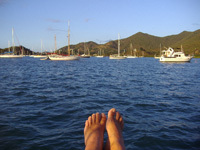 We were planning to sail back to Europe in spring 2010, but in December 2009 we were dismasted en route to the Antigua Charter Yacht Show. We designed a new rig, sails, and a bunch of other bits and pieces, and plan to build them ourselves. Should be fun (more fun than losing the complete rig overboard!). We will then stay in the Caribbean this season and hope to return to the French canals soon. We are "boat folk" so we know the charter boats, the crews, and a bit about sailing... And, as liveaboard cruisers who lived on the French waterways for many years, we have a fondness for barges and want to share this unique experience with you. It's a great way to see the countryside and view the culture.